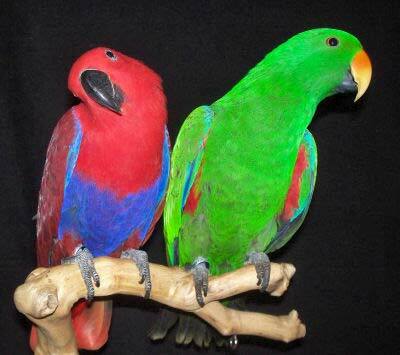 Family: Psittacidae "Holly" and "Polly"
Eclectus are real show stoppers with their beautiful, vibrant coloring! The lovely Eclectus parrots Eclectus roratus are attractive and intelligent birds. They are some of the most brilliantly colored of all the parrot species, and they are also some of the most sexually dimorphic. Eclectus that are well socialized when young make very affectionate pet birds and enjoy human attention. They are one of the better talkers and delight in making various sounds heard around the home, such as the microwave or the telephone. Eclectus Parrots have a laid back personality that their humans adore. They are quite content to sit on a perch for hours at a time playing with their toys. They do not like commotion and they do not react well to it. They are calm birds in captivity, but will display a pensive nature when faced with new things or situations. They do not adapt easily to new situations or environments so its' human must be patient and adjust to having a somewhat shy, three year old child-type companion. They can be very territorial of their cage area. So should be removed and placed on a perch for extensive time periods, at regular intervals and preferably daily. The Eclectus personality has been misunderstood. Many have said this species is boring, dull, lethargic and even stupid. This is not the case. The Eclectus exhibiting these behaviors is showing its reaction to stress. The Eclectus is an intelligent bird and when taught properly, they are capable of cognitive behavior from a very young age. The Eclectus is not a demanding bird and is relatively easy to care for; however, they prefer a daily routine. They are slow to adjust or adapt to new things. If you are providing your Eclectus with a new toy, for example, introduce it to him outside the cage. Then let him see it outside the cage for several days before you hang it in the cage. They love new toys but they will stress at a rapid change in their environment. Homes with children, plenty of company, and lots of play and activity is not the best home for an Eclectus. But they do make a good pet for someone who lives alone, rarely has company, and where the environment and daily routine does not change. These parrots can also be rather noisy and are best suited to environments where their loud calls are not a bother. Female Eclectus are the dominant gender. Consequently females tend to be louder and more moody than the males. When a female reaches breeding age, she may become more aggressive. She may also become occupied with checking out nooks and crannies around the house or aviary, looking for potential nesting spots. Eclectus Parrot Sings "You are My Sunshine"
The Eclectus parrots are found in the northern parts of Australia, New Guinea, Soloman Island, Maluki Islands, and other outlying Pacific islands of eastern Indonesia. There is only one living species in the Eclectus genus, Eclectus roratus However there have been fossil records discovered found on the islands of Tonga and Vanuatu of a similar species, though with smaller wings, Oceanic Eclectus Parrot Eclectus infectus, which is now extinct. The Eclectus parrot has evolved into at least 10 subspecies, four of which are available in the pet market. Currently six subspecies are described. Experts have not yet determined it some of the others are true subspecies or possible hybrids. Differences in the subspecies are specific to the location they came from in the Pacific Islands and include size, head coloration, and brightness of plumage. The females in each subspecies appear quite similar, but the males vary widely in their markings. When they were first brought to the United States, many did not see differences in the coloring between the subspecies and so the Eclectus parrot was hybridized while bred in captivity, which has led to variations in coloring. The Eclectus are quite plentiful in many of their native areas, and in some places are even considered pests. Yet because of the remote locations some of these birds inhabit, the number of subspecies is undetermined. As with the feathers of many fancy birds, the bright feathers of the Eclectus are used by natives for decoration. The Eclectus roratus is on the IUCN Red List for Endangered Species as Least Concern (LC). The Eclectus parrot Eclectus roratus was first described by Muller in 1776. They are vividly colored birds with tight interlocking hair like feathers which produce a sleek glossy plumage that actually looks like silk. They are a large stocky parrot, being 14 to 15 inches in length (35 cm), and have a short square tail and long round tipped wings. Differences in the subspecies are specific to the location they came from in the Pacific Islands and include size, head coloration, and brightness of plumage. What is most striking about the Eclectus is the vivid difference in coloring between the male and female. The Eclectus Parrot is the most sexually dimorphic of all the parrot species. The male is a bright green and the female is a bright red. The male Eclectus is brilliant green on top, has yellowish-green wing coverts, and has red patches on the breast and under the wings. The tail feathers are almost black with yellow tips. The upper beak is a a coral yellow with a yellowish tip and the lower mandible is black. The iris is a dark orange. The female Eclectus has a rich red on the head and breast while the back and wing feathers tend to a darker red. The belly and the nape of the neck are a dull purple to a blue and the tail is tipped with orange. Their beak is black. The iris of the female is a yellow color and they have a blue ring around the eye. (All young Eclectus have brown irises.). In the wild the Eclectus parrots eats seeds, nuts, berries, fruits, leaf buds, blossoms, and nectar. In your home, fresh food and water must be provided daily. Foods for your pet bird will include a ready made large hookbill seed mix enriched with vitamins. Eclectus must also have their diet supplemented with all sorts of fruits and vegetables. Fresh fruits and vegetables you can offer include green peas, cucumber, young dandelion greens, sweet corn, beet greens, carrots, broccoli, unsprayed lettuce, chickweed, dandelions, eggplant, green peppers, sorrel, spinach leaves, tomatoes and zucchini. Fruits that you can offer include, apples, peaches, apricots, bananas, pears, plums, raisons, and most other fruits. Avocado and chocolate are considered toxic for birds and sugar and salt should be avoided. To keep the Eclectus healthy, the fruits and green foods are essential. Dry seed is notably deficient in Vitamin A, which is why they need additions to a seed based diet. Their digestive tract is adapted to a fibrous diet, which is provided by the fruits and vegetables. If deprived of a fibrous diet, they may develop Candidiasis. (see ailments below). Eclectus are also prone to becoming fat, another reason why they should be encouraged to eat more vegetables and less oily seed. A cuttle bone or a calcium block is a good source of calcium. Most parrots enjoy and occasional shower or bath. A shower can be accomplished with either a hand held shower sprayer or a hose with a fine spray head and lukewarm water. A bath pan or ceramic dish 12"-14" (30-35 cm) can be placed on the bottom of the cage or mounted at about 39" (1m) above the floor in an aviary. The wings should be kept trim if you want to discourage flight and to prevent the loss of your pet through an open window or door. The beak and claws need to be trimmed if they are not worn down from climbing and chewing. A cage best suited to adequately house an Eclectus parrot would be between 4 feet to 6 feet (100-150 cm) high and have a floor space of 2 feet by 3 feet (60 x 100 cm). This size will provide room for lots of movement as well as space for perches, food dishes and a variety of playthings. A room to adequately house 2 Eclectus needs a ceiling height of at least 6 feet (180 cm) and a minimum floor space of 3 feet by 5 feet (100 x 150 cm). Perches should be natural wood ranging in size from 2 – 4 inches in diameter. Various sized fruit tree branches work very well. Playthings can be such things as climbing ropes, chains, bells, parrot swings and wooden or other bird toys. An outdoor or breeding aviary needs to have a protected shelter that can be heated and cooled if necessary. It should be no smaller than 4 feet by 6 feet with a floor space of at least 3 feet by 3 feet (1 m x 1 m), be off the ground by 4 feet, and have an attached flight cage. The flight should be 79" - 118" (2 - 3 m) long with a perch at each end. A climbing branch and a bird bath are nice additions too. Eclectus parrots are tamed easily and are very sociable. Some humans feel the male is the more talented, with more talking ability and easier to tame. Females, in the wild are the more aggressive of the two. However, both sexes can become affectionate pets and enjoy human handling. You should give a new arrival a few days to get use to you, your voice and its cage before trying to handle it. The Eclectus is a shy creature and they need a period of adjustment. A hand fed baby will not need much taming and can often be handled right away, but be patient and go slow. Allow them to hear your voice, get the scent of you. Remember that taming and training a bird takes patience, never 'punish' your pet! This only serves to destroy the trust you've spent so much time building. For more information on training your eclectus, see Parrots: Handling/Training. Exercise and play are important activities for the physical well being and psychological health of your parrot. These activities help deter distress and prevent the problems of screeching and feather picking. Provide your parrot with lots of activities in the form of large link chains, bird ladders, parrot swings, ropes, fresh branches for gnawing and chewing, and rotate new bird toys on a regular basis. Sexing Eclectus parrots is simple. The adults and even the chicks are dimorphic, meaning the males are mainly green and the females are red and blue. The biggest challenge is mating members of the same subspecies. There are four subspecies of Eclectus available and they can be difficult to distinguish between. If you are a beginner looking to breed, you should seek the aid of an experienced breeder to help you choose birds of the same subspecies. was one of our favorite Eclectus. companion and a fun pet! The Eclectus has an unusual and complex breeding culture in his habitat, resulting in communal breeding where uncles and aunts help rear young in a group family situation. This sharing and caring feature of the Eclectus personality carries over into its human home and it is what makes them a good pet. Eclectus parrots are polygamous by nature. The females may mate with multiple male suitors and males may travel from nesting site to nesting site to mate with multiple females. This unique breeding strategy may explain the pronounced sexual dimorphism of the Eclectus. Perhaps the female is a vivid red as she stays in her nest for up to 11 months out of the year and her coloring enables the males to locate her. She rarely leaves her nest and is totally dependent on the males to feed her throughout the year. The males being primarily green blend in with the green of the forest as they travel from nest to nest in hopes that one of the females may select him as a mate. Suitable hollows are at a premium in their native habitat and the female will vigorously defend her nesting site perhaps even fighting to the death. This protection of her territory is what carries over to her protection of her cage within her human's home. Bonded pairs will readily nest, which makes the Eclectus a fairly easy bird to breed. While most large parrots will usually only lay (and rear) one clutch of eggs in an outdoor aviary, the Eclectus are "free-breeders" and may nest several times during a breeding season. In the wild, they are seen nesting in groups with each pair making their nest very high up, in the hole of a tree. Eclectus will need a nest box mounted as high up as possible. It should be at least is 31"-39" (80-100 cm) high with an inside diameter of 12"-14" (30-35 cm) and an opening of 4"-5" (10-12 cm). Provide some bedding material inside on the bottom of the box. In the wild their nests have been observed to have the eggs laid on wood chips. An Eclectus female will usually lay 2 eggs. The female will brood for 26 to 28 days while the male brings her food. The hatchlings will leave the nest at about twelve weeks. Beware of over breeding. Free-breeders are prone to having a calcium deficiency. This can result in complications of soft-shelled eggs and egg binding. Provide plenty of calcium. Cuttlebone is an excellent choice not only for the female but also for the chicks, as they are prone to rickets. Be sure to remove the nest box after the brooding until you are ready for them to nest again. If you notice any of this bird illnesses in your Eclectus, immediately provide a warm, draft free, secure environment kept at about 86°F (30°C). Place food and water close to the perch where it is easily accessible. An ailing parrot should be taken to a avian veterinarian for diagnosis and treatment. The fungal disease, Candidiasisis is associated Indonesian parrots including the Eclectus parrot, because these birds need a relatively high amount of Vitamin A. Candidiasis is apparent in the mouth. The bird will play with its food rather than eating it, and you may notice a sticky whitish discharge from the beak. Inside the mouth will be whitish patches of Candida fungus. Your vet can give you medication for this, but you will also need to improve the birds diet. Behavior problems usually stem from something missing in the bird's environment. Boredom, lack of trust, lack of interaction with other birds or people can lead to problems like biting, feather plucking, and screaming. Try to develop a bond of trust and spend time with your bird to help avoid these problems. Eclectus parrots have been successfully bred and are readily available, though they are moderately expensive. Sounds like you've got a male ring neck parrot. Hi I know you must be nervous. I also got a eclectus parrot that needed a home. I was not really prepared. I was bit by a bird mite and got her 5 days later. I had to be treated for scabies and Roxy (wild) had to go to the vet too. That is first thing I did. Next I read up on them and ran and threw house for my teflon pans and cookware out the door. I was screaming but remain calm. (Cast iron skillet are the best.) Toxic for bird with blow dryers and all. Roxy does get a dose of mite and lice spray. Three times on the back. She just puff up and there they go flying. Scratching is normal. That's went I use the spray after a bath. We don't want to raise those chiggers into big mites. She was sweet. She sings the whole song Tom Dewey and all these tricks others had taught her but sound depress like "Why did they give me up?" I was dancing on the floor with her on my arm. Then she change. Pow like to got in the eye. Her mood change. We where fighting over a load of clothes dirty clothes on the floor while she look for a place to lay her egg. I realized she not to be toyed with. She special and as much as we force them to live up to our demands I was wrong for they are tropical amazing birds. There needs need to be meant. I feed her Pretty Bird Species Specific. I don't use bleach in my house. I use vinegar and water. Most restaurant do. I use Old English to dust. I use bleach very lightly in the toilet with door shut. I use my perfume in the bedroom and away from them. I took all aerosols out of the house to hair spray to cleaning agents. You know I think I going to live longer. My house might smell like last week fish but I don't think that's pollution or harmful toxins. I am sure my bird Roxy has liver damage but we are working on that better life. Well Roxy did lay an egg. I have to feed her one boil egg a week shell and all. She eat veg. Someone said NOT CAN FOOD like it poisonous not true just not nutritional. They said they like their veg cook not true. I just give the washed vegs like carrots, sweet corn, pumpkin seed, sweet pepper, onions, cooked turkey, fried chicken (not cook with peanut oil). I do cook oatmeal and feed dry cereal (no sugar in cereal). Now bread is cake to them so don't fill them up with lots of sugar and sweet. Wheat bread better. Dry whole wheat spaghetti. Cook you up some beans and cornbread and keep looking on the internet. Roxy did get sick. I took her to the vet. The egg did not hatch and her head down low saying chirp, chirp, chirp. Doctor gave her a shot but he really did not think she was sick. I paid for a male. More money. Bigger cages. Most information I got by calling Avian Adoption Centers who help me more I found on the internet. They help a lot and was friendly. I have to have someone to take them if anything happen to me anyway. I learn more about their needs on the internet too. Oh yes they throw out there food and I got roaches but solved it by buying Red Lake earth Diatomaceous and it kills all bugs. So that problem was solved until the rats love all that food and then I got me a kitten and she does a good job and now I can have a dog because diatomaceous kills fleas. Very safe to use. Oh the good news is that I we have a new member to the family. JuneBug born in June this year. She will be looking for a new home in January if things goes right. Mom and Dad molted but not bad. Stressful for them to raise her and feed every two hours then four hours for these months but she coming out of her nest to met others. I felt a good bath buy water holes to clean cage and lot of sunshine helps with molting. Yes, don't ever give a bird away. They just sell it. They are very emotional too and will miss you very much. The money I will be getting from the baby will go to the parents health and their care only before another. I hope my story will help you anyway. Pet store help me. Breeders help me and so did Avian Adoption Centers in your state. Some birds just HATE bathing - I don't care what anyone says. I place one in a walk in shower and turn the water on and he seems to sorta like that. Another - I can always count on every time I run the vacumn, he will run into and bathe in his water bowl or any other bowl. Another we bathe in the kitchen sink with a sprayer. I also use Aloe Bird Bath. I have no great idea except just try things. He may NEVER like it. I have also found it is much easier to bathe them when it is raining. Most love their baths but some just don't. Tail - this is the time of year when parrots are at their worst looking. There old feathers - many of them especially when no bathing - look tattereed and dry. They are the old feathers. They are going to replace every feathers this time of the year in a big molt - all the old feathers will go and all the new ones will come in. My eclectus did the same thing. Hated bathing, so we can only bath her with us and perferably with my husband as he is her fav. I have 2 breeder Eclectus parrots. I run the shower for about 1-2 minutes and set them on the floor of the shower. they are 4 months and i put them in the shower shut the door for another 1-2 minutes then look in. they are so sweet and lay at the bottom with their eyes closed and the water hitting their backs. hey there, my 15yr old female was pretty much cage bound when i got her. previous owners had much more demanding birds and being an eclectus they assumed she was comfortable. she wasnt! That being said my family and i tried very hard to gain her trust it took a long time. biggest change happened when we changed her name. she truly became an active part of our flock. I had previously did my homework and learned the hen wants to stay home and hen, i use this to my advantage. i started with a spray bottle misting above her, and now we are to the point where i take her and sit next to the shower and she watches my mate wash up. she loves the water splashing her. either way we are all winning. if your bird has previous owners you may need to think outside the box. like i said my bird was forgot about has feet problems and what not but they are no longer an obsticle with a better diet, more options for out of the cage (we bought her a bigger cage quickly) playtime, and some strategy on our part we are all enjoying our mornings lol. good luck on your adventure. I'm trying to decide whether or not to adopt an Eclectus parrot. They have a male Eclectus that has been there a while. Before he came to the rescue, he had a bad life and plucked a lot of his feathers. I don't know if an Eclectus parrot would be good for my lifestyle, however. I work at home and if I get done with work at around 12:00 PM, I could probably have him out for almost the rest of the day. I don't leave the house much. One thing I'm confused on and haven't found any answer to is how many times I should be feeding an Eclectus daily and how much of each food daily? Any help is appreciated. My Rosie has been my baby for 2 and a half years now. I hand reared her and she speaks so well and is so adorable. Past month or so, she has started to be rough with me and makes growling noises and attacks me. This could be around her cage, or out. 90% of the time she is good with me. She always wants to be near me which is so hard. Rosie flaps her wings in the cage, just like she is ready to fly on my shoulder but obviously she can't from the cage. She is also very itchy and is forever picking on her wings. Not losing any but just picking and flapping. My concern is her anger. I have read that she could be hormonal, and also that she might lay eggs, but can this happen without a partner? I'm a bit confused. Any personal experience and info would be great. The correct amount of food to feed on a daily basis is hard to determine. Usually people who have birds in training will weigh out exactly how much they want to feed, but for most keepers it depends. Some pet birds are very wasteful, 'playing' with their food at times instead of eating it. The best way thing to do is make sure your bird maintains a good weight and is healthy. Feed a variety of fresh foods, along with a dry food like a pelleted diet. I have a female I rescued. She is about 34 years old, according to the vet. She was abused before I got her. She's very aggressive. More so when she lays her clutch though. Henryetta growls at anyone she doesn't like and when she wants to be left alone. Mine was plucked almost bald when I was given her. A complete avain checkup, required a Rx of Prozac, to break the habit of plucking as well as a major dusting for mites. After 15 years of owning her, she will only step up on her own terms. She's very aggressive in my house, but take her outside or in my truck, I can let her head without losing a finger. Good luck and let us know how things are going.